In our last post, we told you about few amazing features of Windows 10. Windows 10 is all set to be released on 29th July 2015. The best thing about Microsoft Windows 10 is that users who have Windows 7 or Windows 8.1 will get a free upgrade to Windows 10. However, you will have to reserve or book your copy of Windows 10 for the free upgrade. Upgrading to Windows 10 is very simple. You just need to follow the below-mentioned guide for your free copy of Windows 10. How To Get Windows 10 For Windows 8.1? For getting Windows 10, your existing Windows should be updated. If you don’t have the updated version of Windows 8, just make sure that the Windows automatic updates feature is On. After enabling this feature, your Windows will get updated to Windows 8.1 or Windows RT 8.1. The installation will take approx. 30 minutes and you will need to restart you PC for completing the installation. You can also check whether your PC is updated or not. For confirming the update, go to the Start screen. Now, if you can see a search button near your account name, it means you already have the update and your Windows is all set to get the free reserve. Go to the Windows System Tray in the lower right corner and click on the Windows Logo Button. A dialogue box will pop up after clicking on that button. 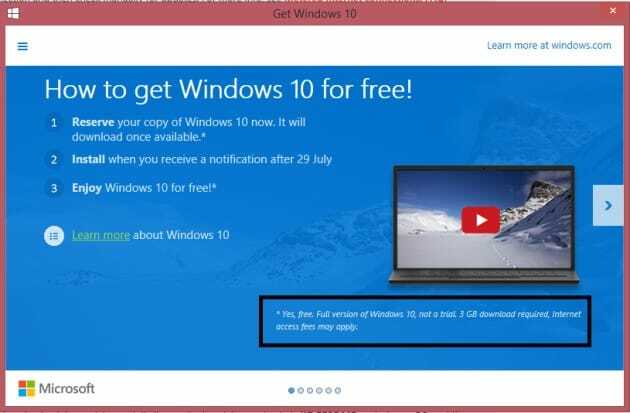 It will guide you on how to get Windows 10 for free. Click on “Reserve your free upgrade” button. After 10-15 seconds of clicking that button, you will get a following message. 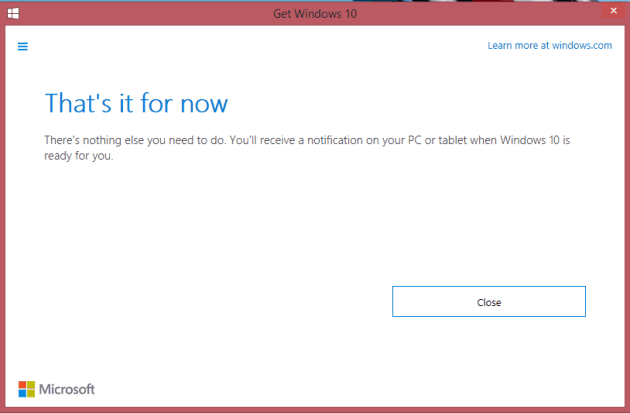 Now, you will get a notification on July 29th for downloading Windows 10. You will get the complete full version of Windows 10, not any trial or limited version. It will be of close to 3GB so make sure you have a good internet connection. How To Get Windows 10 For Windows 7? To get free Windows 10 for your Windows 7, you will need to have Windows 7 Service Pack 1 (SP1). If your automatic updates option is ON, there are high chances that you already have the pack but, if you don’t have, you will need to update it. For this, you will have to turn on automatic updating in Windows Update in Control Panel. Now, wait for few time and you will get a notification to download and install SP1. It would be around 1GB in space and will require close to 40 minutes for installing. You will have to restart your PC for finalising the installation. To check whether you have the service pack or not, click on the “Start” button. Right click on Computer and click on “Properties”. If “Service Pack 1”is listed under “Windows edition”, it means SP1 is installed on your system. Now, just follow the same steps as mentioned in the Windows 8 guide and you will directly get the Windows 10 update for free. Windows 10 will be available for free to only those users who have Windows 7 Service Pack 1 (SP1) or Windows RT 8.1 update in their system. So, that’s how you can reserve your Windows 10 upgrade for free. If you any queries or issues, kindly let us know in the comments below and we’ll guide you right away.